National Bike Week 2017 will take place from Saturday 10th to Sunday 18th June, with bike related events taking place right around the country. Waterford is no different and in fact, we have a very strong tradition where Bike Week is concerned. In all there are almost 50 events taking place right across Waterford City and County over the course of the week to suit all ages and fitness levels. The programme is targeted primarily at those new or returning to cycling or those who just want to enjoy a leisurely spin with friends and family! Bike Week, which is funded at national level by the Department of Transport, Tourism and Sport, is about celebrating all of the benefits of cycling for both recreation and transport. Those wishing to be part of the fun should find an event in a location to suit all comers. There are Family Fun Cycles, bike check-ups, community cycles and school cycling events taking place right across Waterford, from Ardsallagh in the west to Faithlegg in the east and many towns and villages in between, as well as Waterford City itself. 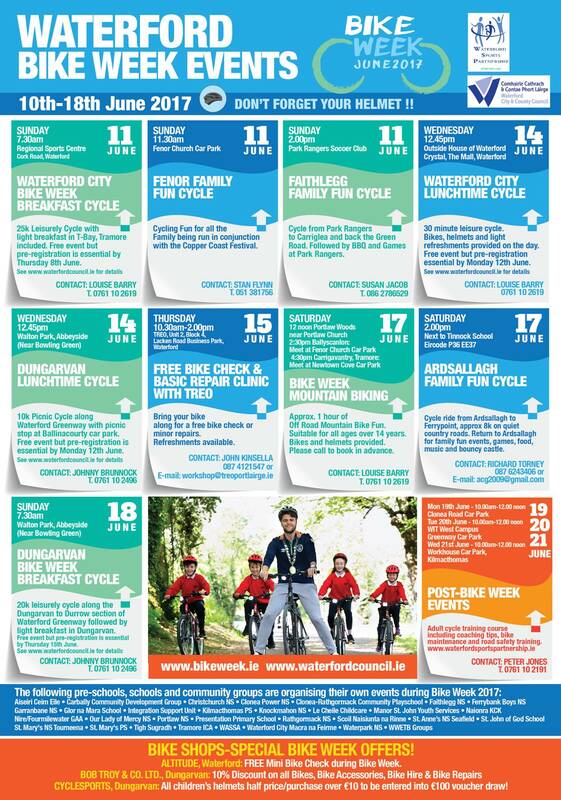 Sunday 11th June: Fenor Family Fun Cycle, Fenor Church Car Park-11:30 a.m.
Sunday 11th June: Faithlegg Family Fun Cycle, Park Rangers Soccer Club Grounds-2 p.m.
Thursday 15th June: Free bike check and basic repair clinic, TREO, Unit 2, Block 4, Lacken Rd Business Park, Waterford-10 a.m. to 1 p.m. Tea/coffee while you wait! These 3 events are suitable for all aged 14 years and over. Mountain Bikes available on the day but booking is essential. Contact Louise Barry 0761 10 2619. Saturday 17th June: Ardsallagh Family Fun Cycle, Ardsallagh, Youghal Br., Co. Waterford-2 p.m.
Monday 19th June: Clonea Road Car Park, Ballinroad, 10 a.m. to 12 noon. Tuesday 20th June: WIT West Campus Greenway Car Park, 10 a.m. to 12 noon. Wednesday 21st June: Workhouse Car Park, Kilmacthomas, 10 a.m. to 12 noon. All three sessions will also include a short Greenway cycle for those new or returning to cycling. Don't forget to wear your helmet and cycle safely during Bike Week 2017! Look out for Bike Week updates on www.bikeweek.ie in the coming weeks. 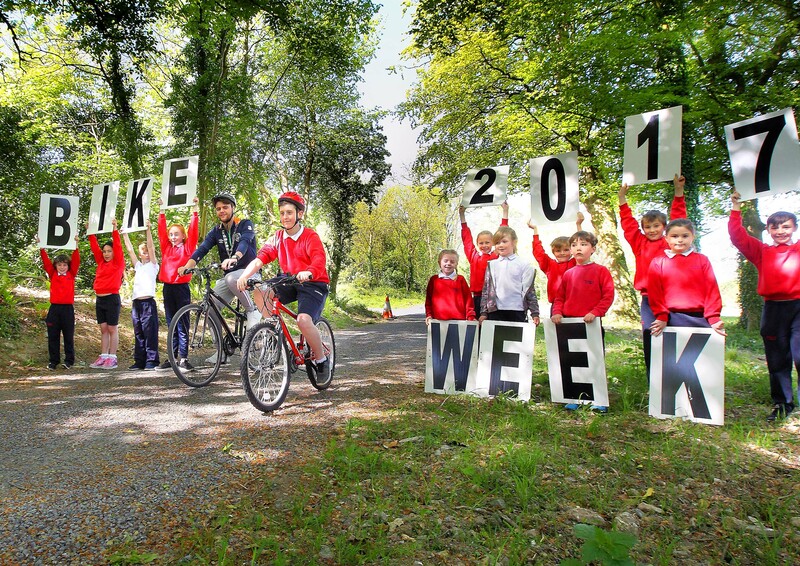 You can also contact the local bike week coordinator Johnny Brunnock, Waterford City & County Council at jbrunnock@waterfordcouncil.ie; 0761 10 2496 for more details on how to get involved. So come on Waterford get on your bike from 10th to 18th June! Tadhg Ó Corcraín, Conchúr Melo, Ella Ní Chaoimh, Sineád Ní Chathaín, Lorcán Ó Murchú, Davia Nic Gearailt, Eoin de Cnoc, Leah Ó Neill, Kayla Ní Treasaigh, Caoimhe Bhreathnach, Billí Bob Ó Floinn, Adam Tebay and Ryan Ó Críodáin at the launch of Waterford Bike Week 2017 on the Waterford Greenway recently.